Our Rewards cardholders are in for quite a ride with our new GEAR UP promotion. 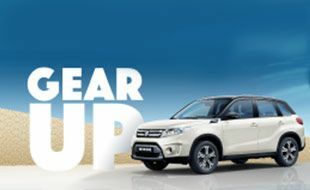 We’re giving away over R450 000 in prizes, including a brand new Suzuki Vitara! Pretty great, right? All you have to do to get a shot at winning this feisty car or a share of the moola is play Slots and/or Tables with your Rewards card between 1 April and 28 June at Mykonos Casino. The more you play, the more tickets you earn and the bigger your chance of driving away with your share of these great prizes! Remember, only Mykonos Rewards cardholders can enter Gear Up . You will get 1 draw ticket for every 100 points earned. Two winners will be selected through the electronic draw selector at 18h00, and two winners at 20h00. These winners will have the opportunity to select one of five boxes on the casino stage, which will each contain a prize. The surplus amounts not won from 12 April will carry over to the Gold cardholder final draw on 28 June. The total prize value per draw date is R5,000. You will get 1 draw ticket for every 250 points earned. Two winners will be selected through the electronic draw selector at 19h00, and two winners at 21h00. The surplus amount not won from 12 April will carry over to the Platinum Cardholder final draw on 28 June. The total prize value per draw date is R10,000. You will get 1 draw ticket for every 500 points earned. Two winners will be selected through the electronic draw selector at 19h00, and two winners will be selected at 20h00. The surplus amount not won from 14 April will carry over to the Black Cardholder final draw on 28 June. The total prize value per draw date is R20,000. The final GEAR UP draws will all take place on 28 June and only one winner will be selected at each draw and stand a chance to win the surplus amounts not won from 12 April. Please read our Promotion Rules and Regulations. Participants earn points by playing slots or tables whilst using Mykonos Casino Club cards. Patrons will earn entries by playing slots and tables with their Mykonos Rewards cards from 1 April until 28 June. Points earning criteria for the car draw on 28 June is 500 points for Gold, Platinum and Black Cardholders, to receive one draw ticket. Patrons will earn entries by playing slots and tables with their Mykonos Rewards cards from 1 April until 28 June 2019. Participants must activate their entry into the draw(s), on the day of the draw(s) prior to the actual draw(s) within the specified times during which the E-Host are open. The opening and closing times for the E-Host will be advertised through mediums used within the casino. Prize Winners who are present will be given 90 seconds to present themselves and must be in possession of evidence of the winning receipt. They must present their SA ID document or Driver’s License. If they do not have the identification in their possession, then their identity can be verified on the EMS player’s database (soft copy of ID or Driver’s License). If their identity cannot be verified, then they will not be eligible for a prize and a re-draw will take place. Participants are entitled to only one prize per draw evening. A re-draw will take place if a prize winner previously won a prize during the same draw night. On the final car draw and cash draw on 28 June 2019, a patron can win the cash and car on the draw night. In the event of technical failure or damage to the device used for the promotional draw, irrespective of the cause, another suitable device or method will be used, at the sole discretion of Management. The Board will be notified of a new device that will be used. The Western Cape Gambling and Racing Board will be informed of unresolved disputes, subject to the provisions of the Consumer Protection Act. Any complaint and/or dispute can be lodged to the Western Cape Gambling and Racing Board. Copies of these rules are available at Mykonos Casino’s Customer Service desk upon request, on Mykonos Casino’s website (www.casinomykonos.co.za) and Mykonos Casino’s Facebook page.